The Home Buying Institute (HBI) offers professional real estate reporting and blog writing services, for agents and brokers want to set themselves apart from the competition. With our blog content writing services, you can make your real estate website the place to go for local housing news and information. It's a great way to boost your website traffic, while attracting potential clients at the same time. HBI is one of the early pioneers of real estate blogging. We've been publishing housing-related news and information for nearly 15 years. In that time, we have learned how to attract a large audience online by publishing quality content that people want to read. Now, we offer those real estate writing services to agents and brokers across the United States. When you purchase website or blog content from HBI, you'll know you are getting the best. If you want to attract home buyers and sellers to your website, you have to go above and beyond the typical content found on real estate websites. Publishing "home buying tips" that already exist all over the internet won't do much to further your case. You need to publish hyperlocal housing information that speaks to home buyers and sellers in your area. And that is exactly what we do. We are more than a real estate blog content writing service. We are veteran bloggers and reporters with more than a decade of experience. Working with HBI is like having your very own real estate reporter, producing high-quality content tailored to your local housing market. "I have a real estate website, but it doesn't get very much traffic." Does this sound familiar? If so, you could greatly benefit from our real estate writing services. Blogging is a great way to increase your website traffic over time, and to generate more leads from local home buyers or sellers. And we can help you do it right. We use real-world traffic data and website analytics to identify topics with the most traffic potential. We will optimize your content using the latest standards and best practices recommended by search engine companies like Google. Over time, this could help you boost your website traffic and generate more leads. You found the Home Buying Institute as a direct result of our real estate blogging efforts. We will use that same expertise to help you bring local buyers and sellers to your website. Have questions about our real estate blog content writing services? Just send an email to editor@homebuyinginstitute.com to get started. We can produce high-quality content on any real estate or mortgage-related topic. We typically select topics for our clients, because we know from experience which ones are most popular among home buyers and sellers. Common topics include local real estate trends, home prices, housing-related forecasts and predictions, mortgage programs, and other information relevant to buyers and sellers. We produce comprehensive, in-depth real estate reports and articles that usually range from 700 to 900 words. This above-average length allows us to cover each topic in a comprehensive manner, which readers appreciate. The longer length can also help when it comes to search engine rankings. 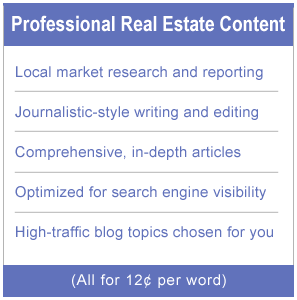 Our real estate blog content writing services are priced on a per-article basis. We generally charge $125 per article. What do I get for the above price? We will research your local real estate market to produce an insightful report using the most current data available. We will edit your content to make sure it has a journalistic quality. We will also optimize it for search engine visibility. You get research, writing, editing and optimization -- all for one price. We can deliver your website / blog content in a number of ways. Some clients prefer to receive it as a text file, and then publish it themselves. We can also publish your article on our site (in a way that blocks it from search engines), and then send you a link so you can copy and paste it onto your website. We can even publish the content directly onto your blog, if you prefer. Can I put my name on the articles? Yes! Once we deliver your content, it's yours to publish as you see fit. You could put your name on it, write your own introduction, tweak it, etc. If you have questions about our real estate website writing services that were not answered above, please email editor@homebuyinginstitute.com.